Banding is one of the simplest and most reliable ways to identify a number of bird species, including parrots. Bands are typically a small plastic or metal strip with a unique set of letters and numbers that is placed around the bird's leg and the band number recorded with the specific bird's information. The owner then has the option to send this band information off to a database to make it accessible in case the bird is ever lost or stolen. Looking up band information can be a lengthy process but is well worth it in the event of a missing parrot. Find a mentor. Many long-term parrot breeders are more than willing to help out a new owner with hints, tips and advice on raising, training and handling these intelligent birds. Write down any questions you might have and keep them handy so that you can gather as much information as possible when you spend time with your mentor. Determine what kind of band your bird has. Parrots are typically banded with either an open band or a closed band. Open bands are used on birds imported from another country and normally only designate their point of entry and an identifying number. Closed bands are normally applied by a breeder and have much more unique and identifiable information for each particular bird. Closed bands are put on birds when they are very young and cannot be removed once the bird is older, so they are very useful for tracking parrots as they age. Read the band carefully to see if you can determine where your parrot came from. Letters are typically the first set of information on the band, and these designate the aviary your parrot came from. 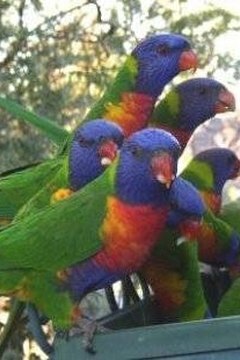 Most are widely recognizable and can easily be identified by people with knowledge of parrots. Speak with your mentor about the band on your parrot. Most breeders are extremely knowledgable on specific banding information and will be able to help you identify what the information on your particular parrot's band indicates. Contact a local parrot organization if you are still unable to find information on your band. Most clubs keep a listing of breeders and aviaries and often have band information on record that can help you with your band identification. If the club does not have information on your specific band, they should be able to refer you to a breeder who can point you in the right direction. Be sure to get all the information on your band and keep it handy while searching for information on your bird. Bands can sometimes be very complex to decipher, and having the specifics available will help in your search. Never try to remove bands from your bird. Many types of bands cannot be reapplied, and a lack of band can make your bird nearly impossible to identify.